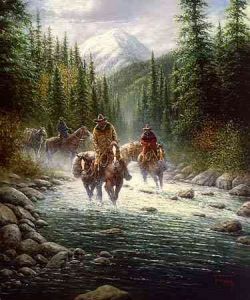 Day is breaking over the snow covered peaks in the Rocky Mountains as these men make their way across the roaring whitewater and down the mountain. They have been privileged to enjoy the serenity and calm of the high country while in search of the great trophy elk. Surrounded by the chill of autumn, their thoughts are on the wonders of the wilderness around them as they are "Heading Home."